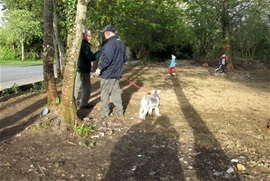 In March 2016, a site at the end of the Mill Road which had been derelict for as long as anyone could remember was cleared of overgrowth and debris, in April sand was spread on the site, the locals living nearby were curious as to what was going on. 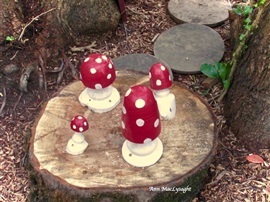 A meeting was held by interested parties and very soon the birds were tweeting and the bees were buzzing with the news that it was going to be a Fairy Garden. 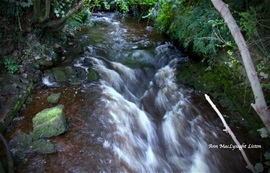 The Mill Race, Mill Road, Corbally. 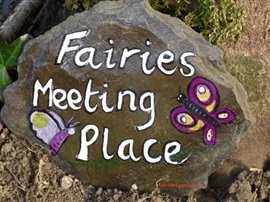 The fairies were thrilled and excited when they saw this beautiful site situated close to Corbally Falls and overlooking the Mill Race at the end of Mill Road. 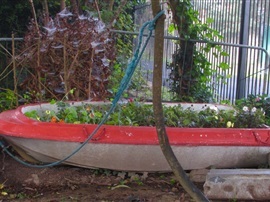 "Rosaleen" queen of the fairies got straight to work building and painting little houses. 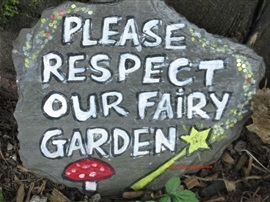 In no time at all, the fairies with their noiseless wings started to flutter in, Fairy Faye, Lilly and Violet were the first to move in, then Tess, Isobel, Poppy, Rainbow, Abbie, Chloe, Pumpkin, Sweet Pea, Ava, Fern, Rose and Ruby. 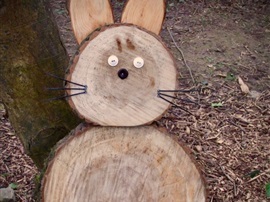 Very soon the Elves got word of this lovely place, Elf Buddy, Nipper, Thistle, Meadow, Pebble and Pollen and several others took up residence. 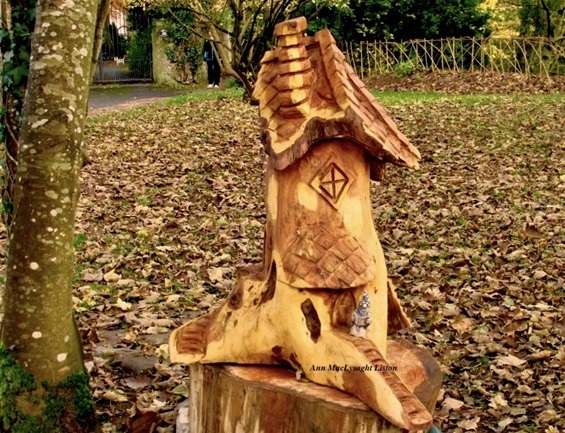 Magnificent luxury fairy house donated to the Mill Road Fairy Garden by Will Fogerty, Fear na Coillte, carved from a Yew tree from Carmel & Denis Daly's garden. To the amazement of the Fairies and Elves in August 2016, this big bald giant head arrived in the Fairy Garden, in September it got big eyes in order to keep an eye on all the comings and goings in the Fairy Garden. As time went on it grew a fine head of green hair. 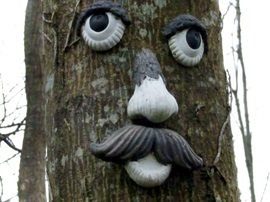 Now it was time to give this big head a name, so the Fairies and Elves sent out a request on their Facebook page, asking children to name the green giant head. Of course the names came flooding in, names like Humfrey, Gooper, Foster, Bumpy, Peek, Freddy, Flumps, Milo, Chester, Elliot, Paul, Sheldon, Grover, Sod, Duddkes, Millie, Gabo and Olaf to name but a few. Dugie proved to be the most popular name. MY NAME IS DUGIE. PLEASE DO NOT CLIMB ON MY HEAD. THANK YOU. 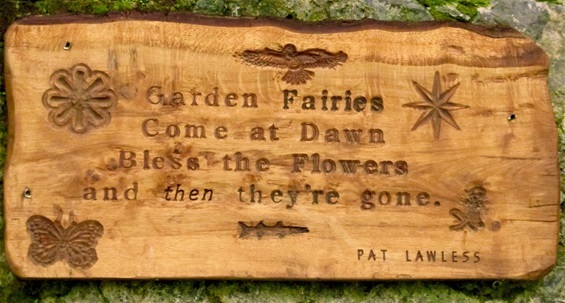 Exquisite wood sculpture sign, very kindly donated to The Mill Road Fairy Garden by Pat Lawless. 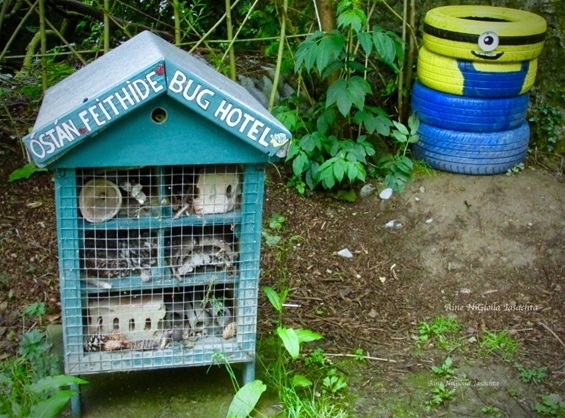 All the bugs and insects creeping and crawling around the Fairy Garden needed a home too, so Pat Lysaght made and donated the Bug Hotel, much to the delight of the Fairies and Elves. 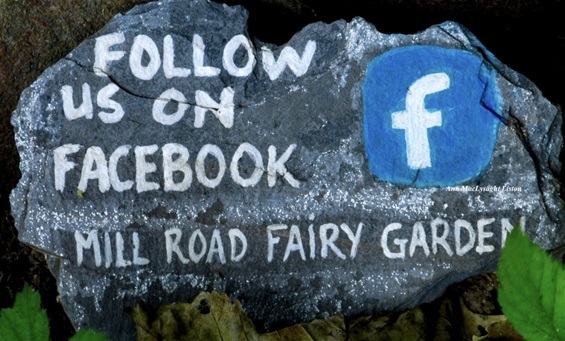 The fairies living at Mill Road Fairy Garden now, are all gentle and beautiful, they live a joyous life, swimming from the rocks in the Mill Race and gliding down the sluice, poling on Corbally falls and dancing in the moonlight to their own sweet music. Traditions of the fairies show that they love beauty and splendour, grace of movement, music and dance, everything in fact, that is artistic. 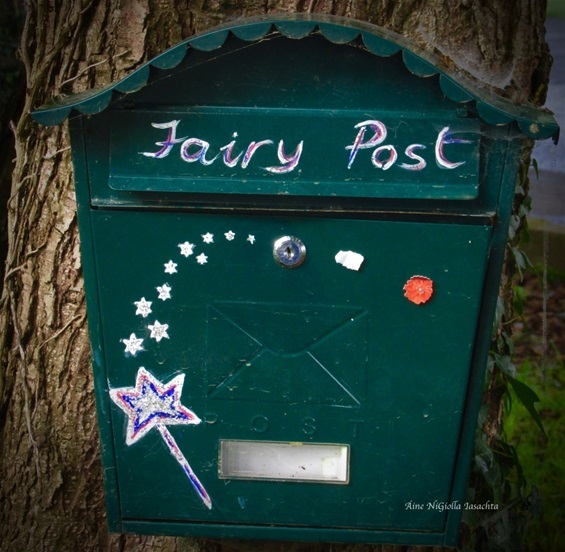 The fairies and elves have a post box too, "Rosaleen" the Fairy Queen personally attends to all the mail and is very pleased with all the lovely letters and drawings. With houses made from twine. 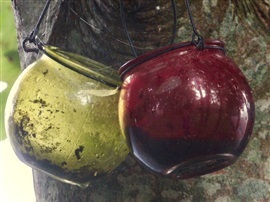 So that our faery friends can dine.